Have you ever wanted to challenge the status quo of health care? Have you ever had an idea but didn’t know where to take it? Well there’s an app for that, or rather, you can build an app for that, at the Hacking Health Design Challenge. 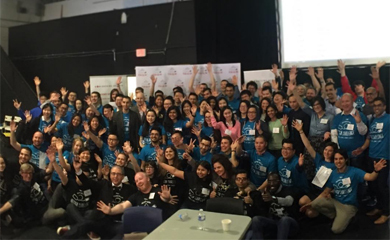 Hacking Health is a forum looking to bring innovation to health care. The design challenge brings together clinicians, developers, business analysts and designers and sets a timeline of 8 weeks to transform a nascent idea into a working prototype – and beyond. I signed up for this challenge with high hopes, I wanted to model a virtual pharmacy that focuses on deprescribing – and getting the dialogue started with the patient on evidence-based medicine. Planning to disrupt an existing dominant market is fraught with challenges, and many times we felt unsure of whether this idea could hold water. Our first challenge: how do you determine if this is what patients want and identify a market fit? Armed with notepad and paper, we went customer shopping. We took to the streets to survey the general public on their thoughts on medications and their habits, if they search for information prior to filling the medication, and their expectations from their pharmacy and pharmacist. The results reinforced that there is a need for what we are building. How do you demonstrate a viable business when you are actively trying to decrease revenue with deprescribing? How do you build a virtual pharmacy that evokes trust? How do you not break the bank and acquire customers online? And our current challenge: How do you compress 8 weeks of work into a 3-minute pitch? Our team has cumulatively spent hundreds of hours, and many late night sessions working on Disrupt Pharmacy. Our next steps are to cull all our work into a single, compelling and engaging presentation highlighting how we improve health care. Hope to see you at the next health care challenge! Trina Nguyen is a Clinical Pharmacy Specialist at the Fraser Health Authority. In her role, Trina provides support across all areas of parenteral services including intravenous administration device implementation and Parenteral Drug Therapy Monographs.